This letter was written in the camp of the 38th North Carolina by 29 year-old Confederate soldier Elijah Whicker (1835-1865) of Company D. The 38th North Carolina was attached to BG Alfred M. Scales’ Brigade in MG Cadmus M. Wilcox’s Division of LTG A.P. 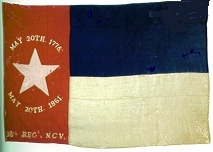 Hill’s Third Corps. At the time that Elijah wrote this letter, he had just left the brigade hospital in Petersburg and returned to his company. He died on 13 January 1865 — just two months after writing his family, “I would rather be anywhere else that I have ever been or ever will be on earth than to be in this army.” No details of his death could be found. Elijah Whicker was a farmer from Deep River District in Forsyth County, North Carolina. He was married to Frances J. Thomas in 1859 and together they had a son named Moses Newton Whicker (1860-1940). I am in the enjoyment of common health and hope this will find you all in the best of health. I had the pleasure of receiving from you your kind letter of 5th inst. on the 9th inst. I regret that you do not get my letters sooner after they are written. I saw M.D. Medearis a few days ago. He was well then. I received your letter that you mailed at High Point when you went there to start a box to me. Enclosed I found twenty dollars & received the box as I wrote on last Saturday. The box has proven quite a good thing when I just growing able to go on duty. I have some of the provisions on hand yet. After writing on Saturday evening I left the hospital and went to the regiment on Sunday. We were held on reserve till yesterday [when] we moved near the same position we occupied for some time before. We are over the Railroad (Petersburg & Weldon). Report says that Lincoln is again elected. It is not known who is elected for President nor do I believe it differs much which of the candidates are elected for they will carry on the war with as much energy as they have heretofore. The weather is very cool today. Last night was much the coldest we have had. All the men have fixed some times sort of place to stay in of a night. All suffer more or less with cold. The recent call for soldiers has brought into ranks many more men & some of the wealthiest have now come to the field. Rich men nearly fifty years old are frequently to be seen among our ranks. They grumble on the strangest terms. It is thought by some that we will take up winter quarters here on this line. This is a Sunday morning. Last night the ground froze a little. Today is clear and very cold. Some of our secession neighbors are beginning to realize the beauties of their peaceable Secession. I have nothing to write worth your attention. Nearly every soldier is tired of this cruel war. I am anxious to hear from you all. I would like to be at home with you. I would rather be anywhere else that I have ever been or ever will be on earth than to be in this army. I will desist for the present. I am glad to inform you that I am enjoying common health. I hope this will come to hand in due time and find you and Newton in the enjoyment of good health. I wrote a letter last Saturday after receiving your box of suitable clothing and nourishing victuals, informing you of the reception of the valuable present. I want to see you all more and more as time wears away. Think long of it, but have no way of bettering myself as I know if at present. I am glad to hear from you. I read every word with the greatest interest. This is my great great grandfather! Someone is mistaking because I have this letter in my possession and have had it for over 40 years! You can see it if you wish. To larrywhicker: I am writing a book on the battle of Sutherland Station and I was wondering if I might use your ancestor’s letter to quote or cite in my book. I would of course acknowledge your aid in my work. Michael, this letter would be like the other letter you wished to cite in your book. The letter was not transcribed for Larry but for my friend who authorized me to publish it on Spared & Shared 4. I am sure that this letter is from my great, great, grandfather. He sent over 23 letters, that were later sold on E-Bay. The Newton he refers to is Moses Newton Whicker, my great grandfather. I am trying to find his grave location but have not be able to do so. I have pictures of Moses if you are interested. I know Elijah was deferred until 1864 as he worked with his Father, Moses in the Mendenhall and Garner armory in Jamestown. He was conscripted in August 1864 and sent to Petersburg. That is why he was in company D of the 38th North Carolina.